I don’t get out to club gigs much any more, having played a billion of them in my day and gotten really fatigued by it. When a pal suggested we check out the truly legendary Nik Turner, I was leery; then I checked out his recent single “Fallen Angel STS-51-L” and was actually pretty blown away at his expert duplication of and enhancement of the classic Hawkwind sound. I thought, what the hell, let’s go. First, let me state that I know Turner and Dave Brock et al are having one of their periodic fallings out; this is not exactly unusual with former members of bands that share a common legacy. Both parties want to exploit that legacy in their own ways (see: Love, Mike and Jardine, Al) and have a perfect right to, but don’t see eye to eye. As a longtime Hawkfan I’m staying out of that and would be happy to see either band in concert, despite the extremely acrimonious situation; there’s no point in my taking sides, as far as I’m concerned. Disagree if you wish. This particular band was playing The Garrison, a rather small club. I have to give kudos to Turner; at his age he should be curled up by a fire with a cuppa at 10 p.m., not starting a super-loud club set with a band whose average age is about a third of his! But obviously Nik is a different kind of cat. The crowd was a strange mix, I have to say: mostly male, of course, but a mix of older guys you’d expect to see at such an affair with some guys who looked rather, um … hipsterish with their Victorian fop hairstyles, plaid shirts and facial hair. I suppose Hawkwind is enough of a record collector staple to inspire curiosity. But from the enthusiasm of the crowd, plenty of us were very familiar with the Hawkwind repertoire. The show was actually very entertaining for a number of reasons. First, when choosing Hawkwind repertoire, Turner wisely sticks with stuff that he sang or is from the period when he was in the band; hence the set leans heavily on Space Ritual tracks and songs from In Search of Space, Doremi Faso Latido and Hall of the Mountain Grill. In fact, a storming version of “Born to Go” signalled right off the bat what kind of evening we were in for, followed by “Fallen Angel STS-51-L” and a set including such classics as “Master of the Universe”, “Space is Deep”, “Orgone Accumulator”, “Silver Machine”, “D-Rider”, “Children of the Sun”, “You Shouldn’t Do That”, and of course the infamous Moorcock and Calvert-penned spoken word pieces, “Black Corridor” and “Sonic Attack”. All rendered accurately and with energy by the young band that, ironically, was probably doing more “faithful” renditions of the material than Hawkwind has done in at least thirty years! The sound was pretty muddy overall, but that was clearly due to the inability of the club’s PA to handle the layers of space noise in addition to the high-energy rhythm section! Visually, the show was … interesting! A stoic bass player, Bryce Shelton, had his fingers a-flyin’ as he nailed and elaborated on these hoary classics. Drummer Jason Willer did a perfect impression of Simon King’s distinctive fills and blasted us with his youthful energy. Older guitarist Nicky Garratt, who has an accomplished resume himself, provided a slightly different Stratocaster tone to what Hawkfans are used to but also seemed to act as bandleader and played some nice Amon Düül-esque psych solos. And then there were the young women on stage left and right, who acted basically as Stacia, Dik Mik and Del Dettmar rolled into two. One, Ariana Wagaman, was dressed in a rather small blue vinyl dress, while the other, Kephera Moon, while dressed more demurely, had those space-lady arm gestures down pat; at one point they even did some cosmic Hindu goddess arm movements in tandem behind Turner, who in a rather gleeful, satyr-like (but harmless, I must add…) way really seems to enjoy having attractive women in his band. Who can blame the old bugger! 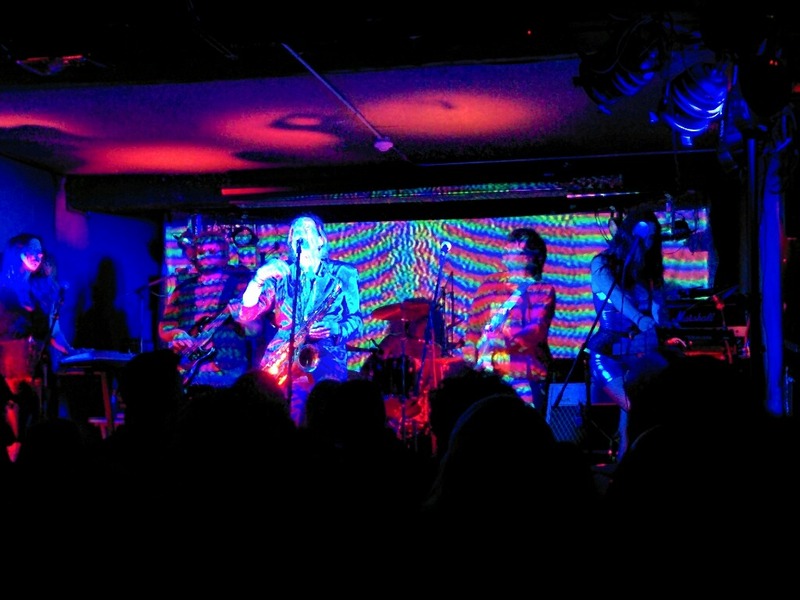 Research suggests Moon is a very active player on the west coast psych scene. All this, in addition to the light show, was basically like a little time capsule back to the glory days of 1972. With both women on the sound effects, duplicating the oscillators and synth effects, it really filled the sound out. Moon served as main keyboard player, providing some nice organ solos, while Ariana busted out an electric violin to demonstrate her talents — I would have liked to have heard more of that. Turner, as noted, presides over the affair with a gleeful look of absolute enjoyment, honking on his sax, trilling on his flute and gesturing grandly as he sings, like he can’t believe he’s still getting to do what he loves, which made his polite request for a pad for the band to crash at even more charming! So an experience I was unsure of turned out to be a great time — Turner’s new music is surprisingly excellent and his band is also excellent, providing the renewal of youthful energy and plenty of impressive musical talent. If you have any reservations about checking out his act (at least musical ones, not political ones), you should put those aside: he is the real thing. ← MYOT’s TOP 10 OF THE BEACH BOYS! that light show projection in the picture is insane, how is it done? projectors? You know, I’m not sure! I didn’t see a projector — it may have been been projected from behind the curtain. Saw Nik last year in Calgary with the same backing band. That ensemble is actually the opening band, under their own name! Very enjoyable last year, and very cool to see them play their own material before then taking on the Hawkwind duties (and totally nailing it, as you said). This year I don’t even have to travel as Nik and co. are stopping in my smaller city of Saskatoon. To see a legend like Nik in Saskatoon in a small and very intimate club is a dream come true. Great review, cheers! That’s good info, thanks. I didn’t realize that and shoulda done my research better! I will be looking into their work then! Thanks for the comment. Got to see them, jam with them and put a few of them up for the night. Excellent musicians and amazing personalities. The Hedersleben records are pretty great too. Nik has certainly found the right people to surround himself with and do his music justice, and then some. When they hit Philly last week I mean. Indeed, I was very impressed both with the musicianship and the presentation. Great show in Saskatoon. So glad I went. Amazing. Witch Mountain were excellent as well. Kudos to Nik for bringing space rock to the ‘Toon! There is only one Hawkwind. It is led by Dave Brock. 45 year journey so far. I approved this comment in the spirit of fairness, but I’d rather my blog was not the battleground of ownership of a rock band’s 1970s repertoire – I made it clear in the review that I’d happily see either act and enjoy both.